With a variety of printing papers on the market, it's wise to choose ones that will not only provide a canvas for excellent quality print but also be economical, user friendly and environmentally safe. One of the most important considerations is to avoid printing processes that involve BPA, a potentially harmful substance often used as a color developer in printer dyes. PrinterStock.com’s canary-colored BPA free thermal paper is one option to consider. Thermal paper requires no ink in the printing process. Instead, the paper is treated with a chemical that will change color when it touches the hot printer heads. The result is an economical, efficient way to produce clear text or images without the fuss of having to pay for or change out ink cartridges. In addition, this paper is BPA free, meaning it's safe for people to handle and environmentally friendly. This particular receipt paper is designed to fit in cash registers, credit card terminals, and POS printers. The canary color of the paper reduces eye strain and produces better contrast for easier reading of receipts. The paper is one ply (48 grams) and comes on rolls measuring 3-1/8 inches wide x 230 feet long with a 3 inch diameter and a 7/16 inch core. Each roll is compatible with a variety of machines made by leading manufacturers including: Axohm, Citizen, Epson, Fujitsu, IBM, NCR, Omni, Panasonic, Posiflex, Remanco, Samsung, Sharp and VeriFone among others. Quantities come in 50 rolls per case. PrinterStock.com’s BPA free canary thermal receipt paper will cost less over time than using other types of transactions requiring ink. This paper generates clear, BPA free receipts that are safe for people and the environment. It is a versatile thermal paper, able to fit a diverse range of machines by type and manufacturer. 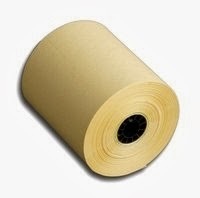 Check PrinterStock.com for values on canary colored, BPA free thermal paper rolls including free shipping offers on qualified orders. When it comes to receipt printing, you’re likely using either a thermal printer or a standard impact printer. Thermal printers and thermal paper can be bought in a variety of sizes, colors and formats. It’s fast, quiet and easy to use. Plus the print is made entirely using heat – no ribbons or ink cartridges to mess with, making it extremely cost effective. Meanwhile, an ink printer might give you more control, text and photo color printing capabilities, etc., but you’ll want to use a high quality bond paper for printing receipts instead of thermal paper. Additionally, thermal paper is not an option in a hot environment, such as a register near a kitchen. Environmental heat can accidentally activate a thermal printer, so you want to consider a location before choosing thermal vs. ink. Nothing is more frustrating than digging out an old receipt and discovering that it's faded to the point of being nearly illegible. UV light can rapidly fade many types of thermal printer paper, but there are styles that are designed to be resistant to this type of damage. While there's no such thing as paper that's entirely waterproof, many types of receipt printer paper are designed to be highly resistant to moisture. Synthetic thermal paper works best in this regard, and it's even better when it is topped off with a water-resistant coating. If cost is your top concern, you're probably going to want to stick with regular 1-ply printer paper. However, if you're more concerned about having receipt paper that's strong, durable and provides a copy for your customers and your business, 2-ply or 3-ply paper is the way to go. Different types of paper are available for both ink and thermal printers, so make sure you’re double checking if you need thermal paper or multi-ply bond paper. POS printer paper is available in many colors. Not surprisingly, white is the most popular by far. White receipt printer paper comes in many different shades of brightness. The brighter it is, the more the images on it have contrast and stand out. Bright white POS printer paper tends to cost a bit more than darker shades, but the clarity makes it well worth it for many businesses. PrinterStock.com offers a wide variety of thermal and bond papers to fit most receipt printing needs. If you’re looking for a special paper feature such as water resistance or a specific brightness that is not readily available on our site, contact our team at 866-748-8273. No one wants to spend a fortune on printer paper, but there are advantages to paying a little more to get the features you need. While our paper prices are already affordable, there are plenty of ways to save on even the best types of thermal or bond receipt paper. By signing up for PrinterStock.com's My Rewards program, for instance, you can earn points that are redeemable for discounts on all kinds of supplies. You basically save 2 percent by being a member, and the program is easy to use. Sign up today!